Clafouti, a classic French dessert, is essentially an egg and cream custard poured over chopped “stone” fruit like apples, pears, peaches, cherries (or any other fruit with pits). 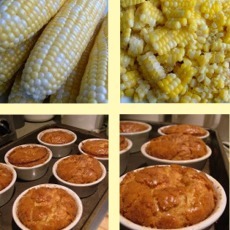 One night, the corn was so tender and so very sweet that I thought it could have been dessert. That is when I thought of recreating Clafouti into a corn and Gruyère savory dish. It kind of tastes like a cross between a popover and quiche. Baked in individual ramekins and gently removed and placed on each plate, it makes dinner a special treat with almost no effort. I get it all ready to bake in advance and chill it until 50 minutes before dinner when I pop it in the oven. Preheat oven to 325°F. Lightly butter six 3/4 cup ramekins or custard dishes and lightly dust with finely grated Parmesan. Set aside in a baking tray. Husk the Corn, boil the ears in salted water for 5 minutes, chill them in an ice bath to stop them from cooking, remove the kernels from the cobs, scraping the ears to catch as much of the Sweet Corn "milk" as possible. You should have around 1 1/2 cups of corn kernels set aside. Sauté the garlic and shallots in butter. Set aside. In a large bowl, beat eggs until pale yellow and fluffy. Add heavy cream, mixing until smooth. Add flour, mixing to incorporate. Add the sautéed Garlic and Shallot mixture, stirring to incorporate. Add the Gruyère, stirring to combine until smooth. Add the salt and freshly cracked black pepper to taste. Divide the custard between the six prepared ramekins. Add about 1/4 cup corn to each ramekin. (You can also add a pinch of grated Zucchini or a bit of sautéed finely sliced Fennel to each ramekin for color if you like.) Bake at 325°F for 35 to 40 minutes or until puffy and just lightly browned. Cool for 10 minutes on rack before gently removing them from the ramekin and serving warm.